Leave it to Edmunds Gages to develop the simplest, dimensional amplifier available for your production measurement requirements. The Accu-Touch™ uses a highly durable, touch screen as its human interface to providing a crystal clear visual display of your measurement results. A 5.7" (145 mm) hi-resolution flat panel display with multi-color graphics, digital values, and limit indicators provide an easy indication of a measurement’s conformance to a tolerance. Housed within a rugged industrial case, the Accu-Touch™ is perfect for on machine, bench top, or laboratory measurement applications. The Accu-Touch™ is available in two, or four input units making it easily applicable to most gaging applications. 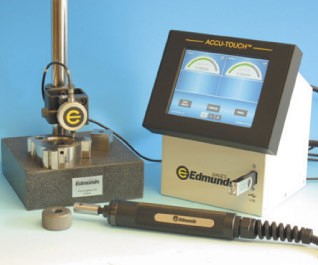 The signal conditioned within is compatible with Edmunds Gages LVDT cartridge probes, & lever probes, with single or dual mastering ability, and Edmunds Air Gage Tools with dual mastering, when coupled with the docking air-to-electronic unit. Base unit provides up to 4 single input measurements. The Accu-Touch™ is fully configurable for virtually any dimensional measurement application with the touch of one finger. All menus are touch selections, where any choice that needs to be made is simply selected by a repeated touch and all volatile information can be password protected. Use the Accu-Touch™ with one single gage or up to 4 gages each with 1-input. Individual dial displays report the live reading of 1, 2, 3, or all of the gages simultaneously, or you select the gage of choice at the touch of the display. In multiple check applications, each measurement feature has its own dial display with digital results, and accept/reject indicators also displayed! The Accu-Touch™ can be used with pure electronic gages from the main display enclosure. A separate self-contained air-to-electronic enclosures can be docked to the display enclosure to provide air-to-electronic inputs while minimizing bench space. Available with 1, 2, 3, or 4 air input models. The Accu-Touch™ can be fully configured for more of the sophisticated multi-dimensional applications with the use of Edmunds Gages “Touch Flash” jump drives. These preprogrammed memory drives take the hassle out of set up and add to the ease of use of the unit. A “Programming Suite“ is also available for expanded capability. Understanding the results of your measurement is key to a gaging amplifier. That’s why Edmunds has combined an easy to see dial, a digital display for exactness, and red and green status indicators for each measurement or check. What could be simpler? Since most of us like to analyze everything, the Accu-Touch will recognize our “Touch Flash” memory drive and record the measurement results at the touch of the display or with the optional footswitch. When you are ready, you can transport the data on the Touch Drive to your PC and open the comma delimited text file with most popular data analysis or SPC programs, or view the data with our convenient “Results Viewer“ right on the Accu-Touch™. • 5.7” Touch Screen Multi-color Flat Panel Display. • User defined LVDT or air-to-electronic input channelsfrom Edmunds medians. • (2) USB ports, (1) RS-232C serial port, standard. • 100 to 240VAC 50-60Hz Global Switching input power. • Inch or Millimeter Displays. • Live, (+) Peak, (-) Peak, and T.I.R. gaging modes. • Upper and Lower Limit Indicators. • Resolution from 2 to 6 decimal places. • For Single (electronic only) and Dual Master calibration. 6.88” W x 8.50” H x (13” with Air) 7.0” D.
174.7mm W x 215.9mm H x (330mm with Air) x 178mm D.
Accuracy: .5% full scale (LVDT). .1% full scale (Air). Linearity: .25% full scale. Bandwidth: 125hz. Resolution: 10µ inch over +/- .020", 1µ inch over +/- .005". Range: Auto Ranging from +/- .004" ~ +/- .040". Expanded (includes Auto-Air Saver port, (2) USB and (1) RS-232 serial ports): #E7204A (4) LVDT or air-to-electronic inputs. #E7110 (1) Channel air-to-electronic transducer with input cable. #E7120 (2) Channel air-to-electronic transducers with input cables. #E7130 (3) Channel air-to-electronic transducers with input cables. #E7140 (4) Channel air-to-electronic transducers with input cables. Automatically shuts off airsupply when air gages are idle. Saves up to 78% of compressed air used. #5917040 for 1 & 2 channel units. #5917041 for 3 & 4 channel units.